Tweaks about buying a "PC" and "HYPERTHREADING" explained ! Being Non Technical Persons, Many of my friends get confuse when the actually want to buy a new laptop or Desktop Computer. There are some things which we should keep in mind while buying a Laptop.All the things discussed below are my point of view. Of-course, a person buying a laptop should watch his/her needs. The first factor that needs to be observed is the size of your Laptop or PC. A small and handy laptops are easy to handle. Big sized PCs or laptops should be considered when moving of a PC or laptop is not an issue. Of-course we are going to stare at our laptop or PC screens for long and long hours and this my harm our eyes.So,we should prefer the screens not having glossy Screens.Glossy Screens are mostly offered in touch screen devices, So,We should avoid Touch Laptops or PCs. Next, It should have a full HD resolutions. Although Laptop companies have built-in keywords and Mouse-Pads we should choose a keyboard having keys giving rest to our hands. A Look should be at Smooth Touch-Pad for better feel. Desktop Computers should go for wireless keyboards and mouse. Whatever we do on our computer needs to be saved and this stuff needs memory.Besides all this a computer also need extra memory for saving and retrieving the process savings.All this needs a good amount of memory. And if you want to do gaming and stuff...A computer having high RAM should be choosen. A latest computers have 8GB and more of RAMs.It is highly recommended to buy latest featuring RAMs. A computer having storage capacity of 1 TB or more that is recommended for today's highly storage requiring applications. Every Pc gives it's best quality when it has a best type of Processor.Intel offers it's processor which successor versions having new features in every release. besides choosing Type of Processor there is one Term used often now a Days and It is "HYPERTHREDING". The technical people at the store use this term very often.Actually, they do not offer the actual knowledge behind the term instead they provide virtual cover by saying that if you will buy the processor of dual core than the processor will become quad core or like this.But this is very false information. 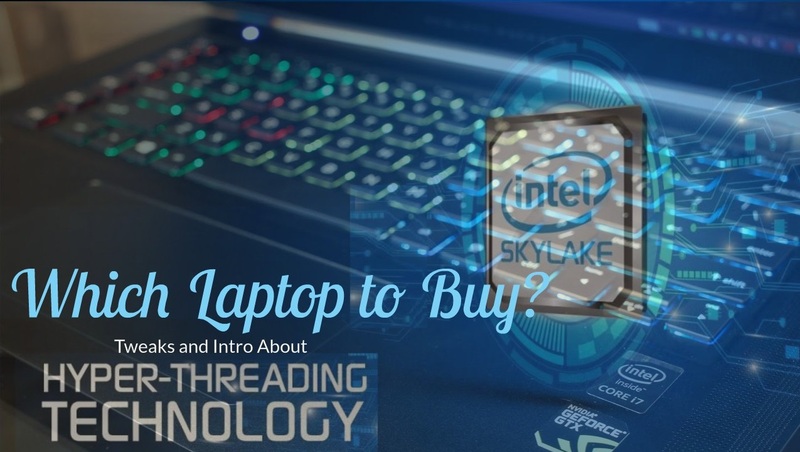 Hyper Threading is a technology introduced by Intel in 2002.Intel introduced this in its "i" series CPUs. It is similar to Multi-Threading Facility.It allows a CPU to work with two instructions and making the computing fast and this gives the effect of doubling the processor speed. As, we Know, Computer CPU can work with only one instruction at a time.But this makes the computer to sit idle and wait for the next instruction. Architecturally, a processor with Hyper-Threading Technology, consists of two logical processors per core, each of which has its own processor architectural state. Each logical processor can be individually halted, interrupted or directed to execute a specified thread, independently from the other logical processor sharing the same physical core. This makes the CPU to work for more than one instructions.So this is the new technology which helps computer to work as a speed a two cores with a single core. To get the advantage of this facility one must have a symmetric multiprocessing support (SMP) in their CPU because this support allows a computer to separate cores. Most of new launches support this facilty and at the end it is basically dependent on operating system we are working on. A good battery life offering Laptops or a Desktop using less amount of electricity should be choosen. So,this was a Small Guide to "HYPERTHREADING" and a small tour to buying a good Laptop or Desktop Computer. NOTE : All the factors above go to buying a best Laptop or Desktop Computer.But going through all this is after all a buyer's choice and it depends on buyer's bugget and need of a buyer. Thank you for these tips and advice! I had some doubts before buying a new laptop but now all of them are gone. And a great discovery for me was that the first factor that needs to be observed is the size of your Laptop or PC. A small and handy laptops are easy to handle. Big sized PCs or laptops should be considered when moving of a PC or laptop is not an issue. Before this I was thinking only about rating of paperial.com .